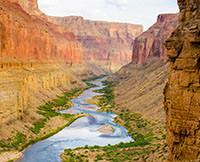 It was my husband's idea and he booked this Grand Canyon vacation with out even asking me. It was done. So I said to myself I might as well try to enjoy it. Enjoy it I did! I loved the Bar Ten Ranch. 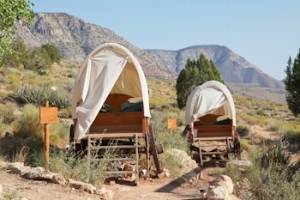 Slept out in a Wagon Train. Rode a Horse. Chopper ride was beautiful flying in to the Grand Canyon. I videod it from my phone Wow!!! Views were spectacular! On the Colorado River, it rained both nights we camped out. The last night we had a flash flood. Our tents had to be moved to higher ground. Joe, RD, Newt, and Travis did a wonderful job. A lot of team work! The breakfast that morning was special, made us appreciate nature good or bad. Would I go again... Yes in a minute! The whitewater rafting, I could not stop laughing! Soooo much fun!